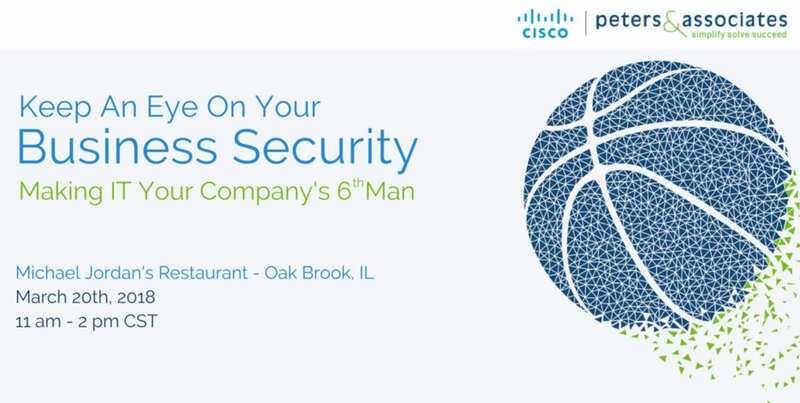 On Wednesday, March 20th, Peters & Associates partnered with Cisco Meraki to share ways IT can be your company’s 6th man. The idea of the “IT 6th Man” came from your typical 5-man starting line-up in basketball, with the 6th man being your supporting player – relied on for his skillset or to take the workload off of other players. The 6th man is consistent, reliable, and ready when you need him, just like your IT managed services team should be. As our luncheon was hosted at Michael Jordan’s Restaurant, this tied into our theme perfectly; thank you to everyone who was able to attend. If you were unable to attend, or just curious as to what we discussed, read on. First up, Peter’s very own Adam Gassensmith “Tipped Off” the luncheon. He broke down the roles of a typical IT team and how implementing your “IT 6th Man” can help clear your IT team’s schedule of busy work and freeing them up to focus on what they need to. Check out Adam’s full slide deck here! After a brief break for lunch and conversation, Russ Davis from Cisco Meraki gave our guests an in-depth demo of Meraki cameras. While demoing Meraki’s products, he discussed the wide range of applications to any business setting. Whether a business needs regular surveillance or to determine what areas are heavily trafficked, Meraki cameras can do it. Interested in seeing a demo of Meraki cameras in action or learning more about Peters & Associates managed services? Reach out to Peters & Associates at 630.832.0075 or email us at info@peters.com. We are happy to help.